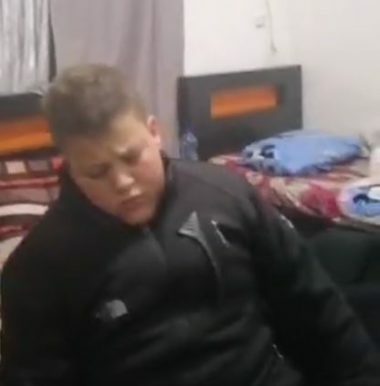 Israeli soldiers invaded, on Monday before dawn, Nabi Saleh village, near the central West Bank city of Ramallah, and abducted a child, identified as Mohammad Bassem Tamimi, 15, after breaking into the property and searching it. As the child was getting dressed to go with the soldiers, his mother Nariman Tamimi was talking to him, telling him to remain silent, not to talk with the interrogators without legal representation, and not to sign anything they try to get him to sign. The soldiers violently searched the property, removing and displacing furniture and belongings, and after briefly allowing him to hug his family members. Then the child was taken away by the soldiers. It is worth mentioning that the soldiers also invaded the home of Mahmoud Tamimi, a member of the Popular Committee against The Wall and Colonies, in the village, and violently searched it. The soldiers also abducted another Palestinian, identified as Moayyad Hamza Tamimi, after invading his home and searching it. Furthermore, the soldiers invaded Beit Sira village, west of Ramallah, and used a drone to film protesters. The soldiers fired many gas bombs and concussion grenades at the protesters. The 15-year old Mohammad is just the latest member of the Tamimi family to be targeted by Israeli forces, for the family’s reputation of being organizers of the non-violent resistance movement in Nabi Saleh. The teen Ahed Tamimi gained worldwide recognition for videos showing her as a young girl standing up to Israeli soldiers and, this past year, slapping a soldier who was invaded her yard hours after shooting her cousin in the head. Her 15-year old cousin Mohammad lost part of his frontal lobe and faced cranial swelling and brain injury after he was shot in the head. For that act, she was arrested and put in military prison for more than six months. Her mother was arrested and put in prison as well. After her imprisonment, Israeli Deputy Knesset Speaker Bezalel Smotrich wrote on Twitter, “In my opinion, she should have gotten a bullet, at least in the kneecap”. In June 2018, 21-year old family member Izz al-Deen Tamimi was shot dead by Israeli soldiers after allegedly throwing a stone at invading soldiers. Nabi Saleh has been an ongoing site of struggle against the occupation and the policy of illegal settlement expansion in the West Bank. This interview with Manal Tamimi reveals the extent of Israeli army violence, repression and harassment the people of the village face.